I love women, but why exactly are their insurance rates lower? If this video isn’t enough and if it didn’t ring so true, I wouldn’t be asking that question. Much love ladies, feel free to flame me back! The Biggest Loser – Does It Work? I mean the show, of course. In looking at this MSNBC article, I’m shocked to see that nearly all of the top contestants have gained quite a bit of weight back. What I find more interesting is the ones that either answer the question of their current weight with, “I prefer to not use numbers to judge my overall health and weight” or with, “I’m currently working towards a healthier lifestyle”, both of which means they’re fighting the fat. But to top it off, pun intended, many of them are either motivational speakers or have books about lifestyle – I’m not sure I would buy their advice, would you? Does this mean that like many other reality shows, it’s just a show and should be enjoyed as just that? Have a gander at their before and after pics here. Damn, Prevention Magazine has run a list of foods that we think would be healthier options but aren’t exactly all that one might hope. I’m not afraid to say that I have chosen these “alternatives” as food choices and now I’m not sure what to do! Check out the list below and here’s the link to read why you might not want to count on them if you’re watching your waistline. She (Kelly Clarkson) has a new blog, and it’s one-way communication – she posts, and no comments allowed. I personally love her so I can’t wait for her new stuff and with Texas on my mind, how can I not? Plus, she reminds me of my female BFF in Dallas – my “Grace”. Speaking of my T, check her out finishing her first marathon. Amazing, inspirational, all that stuff – T, you are an impressive woman! That Mess On Your Head Is Working Wonders For My Self Image! 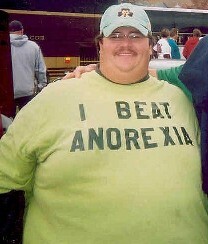 Dude, seriously, eat some carbs would ya? Yes, you look physically amazing – especially for a man that’s 50-years old. But when you get that lean it totally shows on your face and that my friend, is why I choose to stay a little bit porky – it helps with not showing wrinkles. Go here to see more of the photos. Common’s UMC May Induce Kitchen Dancing!!! Actually, I’m glad to know that I’m not the only one who still has a Soul Train line that includes the stove!!! “I think hip-hop artists will have no choice but to talk about different things and more positive things, and try to bring a brighter side to that because, even before Barack, I think people had been tired of hearing the same thing,”. Ugly Sweater Party – Why Wasn’t I Invited? These A-holes had a grand ole time and completely forgot about me – whatever! Honestly, I don’t even know these people, but I was happy to see someone document their potential blackmail material because ‘No Cameras!’ is rule #1 for my Annual Paisley Gala.